James Birnie's Things: What are Memes and why Should I Care? What are Memes and why Should I Care? In recent years, certainly since the explosion of the Internet, and more particularly of social media, the definition of "meme" seems to have changed somewhat. Now, a meme seems to be understood as being something, usually trivial or somehow amusing, that spreads virally across the Internet and refers to some aspect of popular culture. Usually these memes are picked up and altered slightly by each user to fit a new context or to slightly modify the joke. Eventually, if the meme proves popular or durable enough, it can end up having a version of itself on a site like Meme Generator which allows anybody to quickly and easily propagate the meme within their own social network. I myself am not averse to jumping on any memetic bandwagon. I can think of at least two memes that I have been guilty of propagating at one time or another. 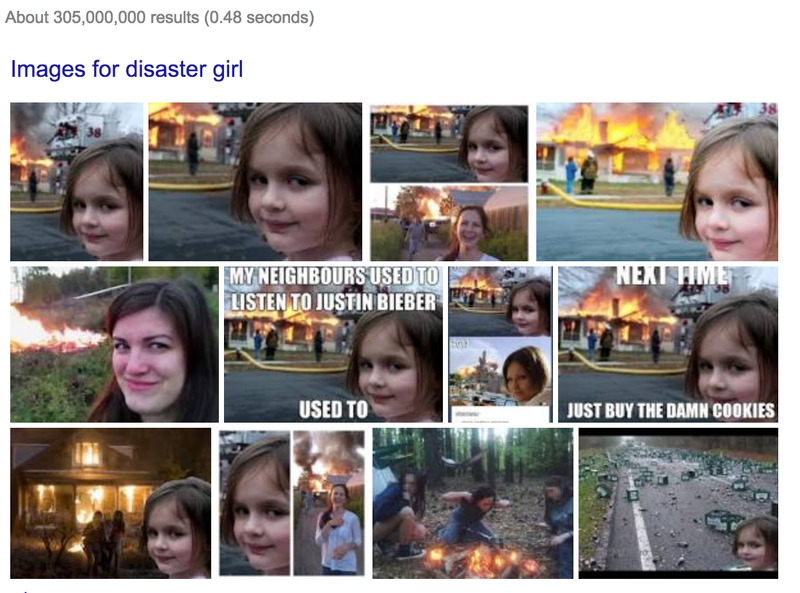 I suppose 305,000,000 hits on Google shows the reproductive power of this one. I like this one too. I came across this one while I was working on a project for ThoughtWorks. I, of course, had never heard of XZibit (he's a rapper) but apparently this derives from a TV program called (I think) "Pimp my Ride", hosted by XZibit, in which the car of a member of the public is customised or "pimped". I think I have seen a British version of this program. 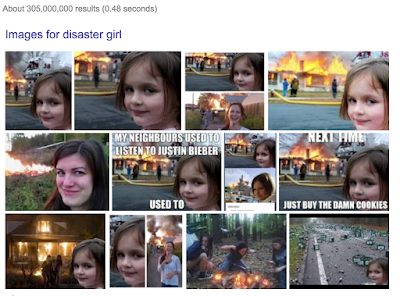 Only 6,330,000 hits for XZibit, nowhere near the league of Disaster Girl but still a healthy reach. Interestingly, the meme is more popular than the person it seems beause when I Googled for XZibit I got 5,120,000 hits. The above search was for XZibit Meme. What appealed to me about this one is that it is supposed to be somehow recursive. When I had that expained to me I was all over it, even without the popular culture knowledge to support any understanding of how it originated. I think this may speak to the intrinsic "value" of the meme and its ability to reproduce itself. I'll come back to this idea later. I used this meme when I found out that defmacro in Clojure was itself a macro. I have recently finished reading The Beginning of Infinity by David Deutsch. I thoroughly recommend it if you haven't read it. The central theme to the book is knowledge, what it is, why we acquire it and how we acquire it. One of the things that is returned to more and more as the book goes on is memes. What they are, why they are important, how they are sometimes useful and how they can be damaging. The word "meme" was coined by Richard Dawkins in his 1976 book, The Selfish Gene. He uses it to refer to an idea that replicates. I haven't read this book at the time of writing and I'm therefore using the definition of meme that I got from Deutsch. The interesting argument is that there are ideas that can replicate through people and culture sometimes without showing any obvious benefit or advantage to the host for the idea. So a meme is an idea that self replicates. That is it. Apparently Dawkins was surprised that his idea of "meme" became something that lasted so long and (I assume due to semantic diffusion) took on so many different forms. According to the Dawkins definition memes can take many forms. Some are useful and certainly convey value to the thing that propagates them. Some are most definitely sub-optimal in many respects and seem to somehow persist despite their lack of obvious value. In the animal kingdom an example of a useful meme could be the way that apes can translate the knowledge of how to use tools, such as stones, for a specific task, such as breaking nuts, in a way that is useful to the recipient of the meme. There is a much richer set of examples to choose from in the human species. The distinction that I want to examine further is that of rational memes v anti-rational memes. There isn't a great deal of time given to why anti-rational memes evolve originally in Deutsch's book, instead it concentrates on how these memes persist and replicate. An example of an anti-rational meme given is that of racist behaviour within sub-cultures inside a largely rational culture. There seems to be little value to the host in holding such views, or of propagating the racist meme to another host. But it certainly persists as do several other memes that present as irrational prejudice. So if we assume that the definition of a meme is an idea that somehow has the ability to replicate then why am I writing about it? Well... As I read The Beginning of Infinity there were a few places in the book that made me think about some of the clients I've worked for. To summarise what I read, Deutsch postulates that anti rational memes can exist in society and can be a reason why societies are static societies as opposed to dynamic, learning societies. A static society is characterised by an aversion to new ideas, suppression and possibly fear of new ideas. A dynamic society that encourages criticism of ideas and assumed knowledge is much more willing to abandon its memes or take on new memes as reasonable criticism may demand. The corporate immune system is a real thing. I've seen it in many different places and I've seen its destructive power. In a modern (aspirationally) agile business, the corporate immune system is the very antithesis of agile values and mindset. I have previously speculated as to how it evolves and have read several theories. I think memetic, self replicating knowledge and behaviours could be part of this reason. Risk aversion and the corporate blame / hero culture are very much responsible too but perhaps those things are themselves memes? I have previously written about Risk Management Theatre and in particular how it can comprise many behaviours and processes that just don't make sense now (even if they may have done originally). Something makes these behaviours and processes persist. Is this some kind of memetic groupthink? Perhaps this is exactly why risk management theatre has a power to persist beyond which any rational thought (at least that I have previously considered) should allow. But when I think about this new understanding, for me, of what a meme is and what memetic knowledge is it begins to make a bit of sense. 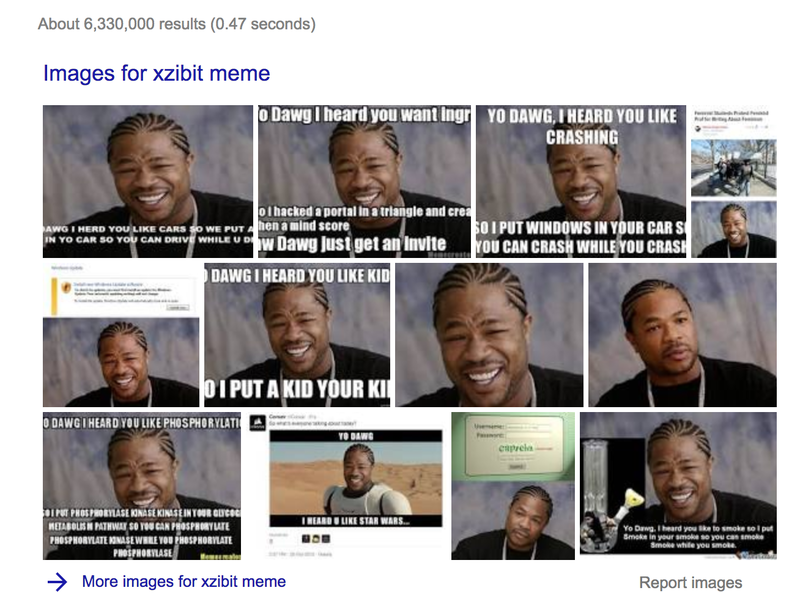 I mentioned earlier that I propagated the XZibit meme without ever having an understanding of its origin. Is this similar behaviour to what I see within an enterprise where new staff carry on the by now irrational behaviours just because that is the way it is done? If we go right back to the dark ages or earlier, when most societies were tribal, it probably made sense to be suspicious of people who did not come from your tribe. It could have been a sensible precaution for there to exist a cultural meme which caused distrust of people that were not from your tribe. It clearly doesn't make sense any more. So perhaps this meme that was once rational is now anti-rational. But does it still exist in the 21st century in otherwise rational societies as the remnants of this earlier meme? So my question is, is risk management theatre as powerful and hard to destroy as it clearly is because we, human beings, have an inbuilt mechanism to recognise, (rationally or irrationally) value and propagate memes? Is a risk management theatre process a meme that was rational at its inception, has become anti-rational, but still maintains its power to reproduce itself and live on in the enterprise? Does it not even matter to people hosting the meme that they have no idea of its origin or its original value? I don't know the answers yet but I'm going to continue to ask the question. I work for ThoughtWorks. When I joined ThoughtWorks I thought I was a software developer but I now know that I am a business analyst, a psychologist, an information sink, a sometime philosopher and occasionally a software developer. I find that learning new stuff, debating its significance and applying that learning to generate new understandings to be the most stimulating of exercises. This is great because that is basically what happens at ThoughtWorks on a daily basis.